We are Shree Momai Roto-Cast Containers an ISO certified company. Our company was established in the year 2002, and is among the most reputed names in the industry for manufacturing, exporting and supplying high tech range of rotational molding machines and pulverizers. The complete range includes Rotational Molding Machine Two Arm, Biaxial Machines, Industrial pulverizers, Open Type Rock N Roll m/c, Multi Arm Biaxial Machines, Roto Moulds etc. 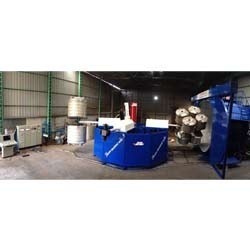 All our machines are known for premium quality, latest technology and durable performance. Our company has grown from strength to strength under the able guidance of our CEO, Mr. Ramchandran Iyer. We as a company have been able to reach the desired level of success, with his guidance and technical expertise. It is his vast industry experience and in-depth product knowledge, which has helped us develop machines and equipment of international quality. Mr. Iyer is a constant source of support and a guiding for everyone in the team. We initiated our business as Shree Momai Rotocast Containers Pvt. Ltd. in the year 1992 at Vadodara (Gujarat, India). It was much later in 2002, we established ourselves as a well established manufacturing unit for a vast array of Rotational Molding Machines and Pulverizers in Waghodia (G.I.D.C) Vadodara. We have been designing, manufacturing and delivering Pulverizer Systems around India since 1992.